This high quality replica is handcrafted from mahogany and comes with a wooden base. 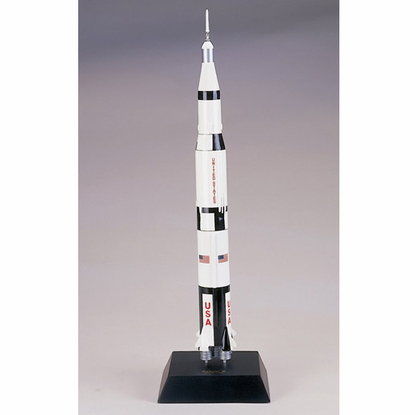 Dimensions are 23"(H) X 6.5"(L) X 6.5"(W)The Saturn V was an American man-rated expendable rocket used by NASA's Apollo and Skylab programs from 1967 until 1973. NASA launched 13 Saturn Vs from the Kennedy Space Center in Florida with no loss of crew or payload. It remains the largest and most powerful launch vehicle every brought to operational status from a height, weight, and payload standpoint. This line of aircraft replicas features the largest selection of military, commercial, general aviation and spacecraft from the beginning of aviation to the present. The majority of these high quality replicas are hand crafted from mahogany wood and all come with a wooden display stand.